This corned beef hash recipe is one of my favorite breakfast or lunch recipes, when I want something just a little different. Topped with a poached or fried egg or two, it is the perfect mix of savory flavors. I don’t know where the tradition of topping corn beef with a poached or fried egg began, but the flavors work together perfectly. See below the recipe for variations. Dice the corned beef. Dice the potatoes. Melt butter in a large saucepan. Stir in the onion, pepper, celery, garlic and mushrooms until tender. Remove the garlic. Add beef and potatoes and Worcestershire sauce, minced parsley, salt and pepper. Cook and stir lightly over medium heat while gradually adding the stock or cream sauce. Stir and cook until well blended and thoroughly heated. Place on a hot platter and serve topped with poached or fried eggs. You don’t need to add the stock or cream sauce to make this corned beef hash recipe. Simply sauté the hash in a greased skillet until it is well browned on the bottom and serve. This recipe includes added ingredients that are optional, like mushrooms, celery, garlic and peppers. Of course they all add their own extra flavor, but if you are a purist you can certainly omit them. The onions are a must have in my opinion. Onions had a wonderful flavor that compliments the corned beef and potatoes really well. Instead of dicing the corned beef, you can grind it if you prefer that texture. The term “corned beef” has always stumped me as there is no corn anywhere near the beef. How does one “corn” beef? I guess real diehard foodies would perfect their own corned beef recipes and corn their own beef. I personally would rather buy a quality version at my favorite deli. 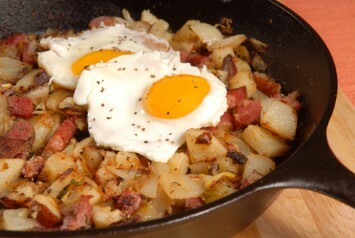 If you like this corned beef hash recipe, look here for more delicious breakfast and brunch ideas.